Adele's Skyfall plays from the big band plonked on the side of the gravel path, accompanied by an amateur male singer from the local school, his voice on the edge of his peak, but a near miss with the song choice. An even stranger song choice for the event. YES James Bond is the closest we get to a British symbol of excellency but the song ambiance is far from welcoming for an Earl & Countess of Strathearn. Aka Prince William & Kate Middleton. The sounds of people echoed from down the street, police van's, ambulance and health technicians cascaded along the green with secret service and security personnel. This normally quiet town isn't used to such drama and chaos. People camped out in cars the night before just to be first in line, but for what? Two beautiful people, fuelled by royal blood and paparazzi spewl. I don't envy their live's, nor would I marry into it. But, for people who are constantly in the lime light, pressured to be beautiful and perfect all the time, I was shocked to see how down to earth, bubbly and just wanting a chat, kind of people they were. And to think, I wasn't going to go!! 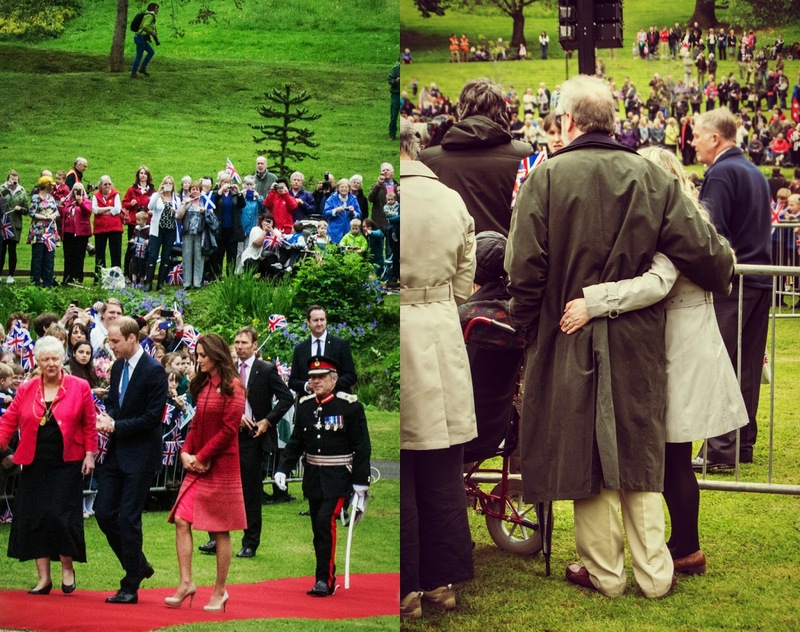 It's not the Royals I have a problem with, not even the squawking of people ooozing over what Kate is wearing, or how handsome William is, no, far from it, it's what happens before that. Weeks, months even years before, everyday people, kind volunteers have been trying to make the little town of Crieff a much more welcoming place for locals as well as visitors. The council has been far from helpfull but not two days before Kate & William showed up, new roads and painted signs were put down, lighting in the streets were fixed, dog muck, litter all picked up, cheesy bunting displayed through the town, road signs fixed, along with decrepit abandoned buildings. The town had never indulged in such TLC. "Ventures" we'd been trying to get the council to do for years, completed over the course of TWO DAYS for the Royals arrival. At least we know it can be done right? But what about all those people who volunteered long before that? The people who'd been quizzing the council for it to be done and been shot down with the lack of staff & money, somehow became non-existent as soon as a sign of Royalty was going to touch foot on the town? Suddenly the council had the staff, money and will to fix the town up, but not for it's locals, not for morals, not for tourists, no, for two people. Two people who will never know exactly how much change went into that town over TWO DAYs just for them? But why would the council do anything for it's locals when they aren't willing to enjoy their town in the first place? 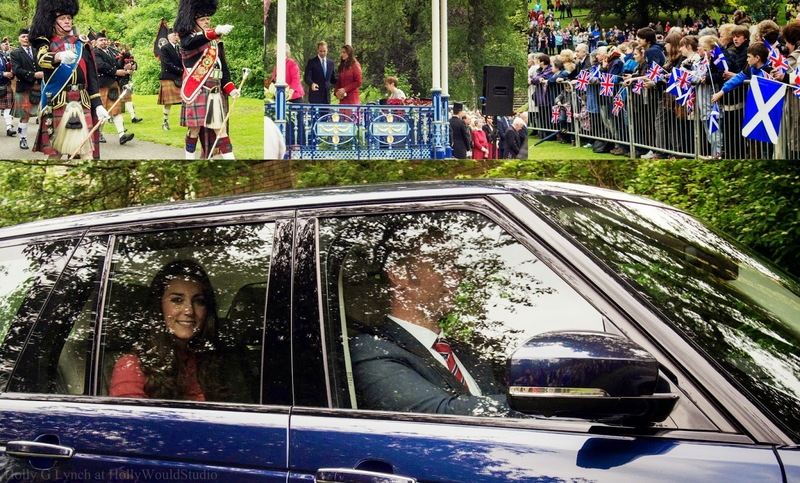 A sheer display of unappreciation was present not two seconds after the Royals jumped in their car and headed off. Those lovely flags that had been handed out for free abandoned along with crisp packets and empty drink bottles across the field of MacRosty Park, this was present around the rest of the town at the latter end of the day. A not so unusual sight from the some of the town locals, I've witnessed on many occasion people tipping their litter into flower beds, on the green, the pavements, and out of cars. A few times I've confronted people about it, usually met with laughs or vexing gestures. If only they put as much energy into throwing an almost weightless inanimate object in the nearest bin as they do running their mouths or lifting middle fingers high in the air? But that's the next thing, the bins, I have to walk half a mile just to find one! In the high street they all congregate in one place, half the time not used, or if so, too full to place anything in, you'll have to cross the street to get to one, and if you've lived/stayed in Crieff long enough you know that takes about 20 minutes to do in itself. There is about 1 bin between the high street and MacRosty Park. So few and far between, it's no wonder why people aren't bothered about where they place their un-wanteds. We recently had a visit from a member of the council for a town 3 hours away from Crieff, she was appalled by the state of Crieff and the lack of care from the council. She then questioned if the council were aware and why they hadn't done anything about the countless things that needed attending to? Things that would never be seen in her home town and would have been sorted as soon as mentioned, sometimes before any of the locals even noticed something needed to be done. "It's sad because Crieff is a beautiful town" she said and I adamantly agree, I have lived in Crieff for four years now and I love this place, I've had an affair with the mountains and hills that it sits around & upon, so to see it being abused angers me. Maybe I'm being snobby? But is it so bad to want to live in a nice place? Why would you want to live in a hole in the ground, littered with dog muck and trash? Or are we so invested in wishing we lived somewhere else that we have no thought to create a beautiful space where we currently reside? The sad thing is the people who read this aren't the people causing the problem, the type of people who have no aspiring imagination and don't wish to enjoy life aren't the kind of people who read articles on confrontation and culture. There I go sounding snobby again but it's a harsh reality. The other harsh reality is council members from other towns don't have much say outside of their residing council, which means they are stuck in the same boat as non-council members when visiting other areas of the country. But that doesn't mean something can't be changed, if enough voices speak, someone has to listen, but it's your choice. This doesn't just go for Crieff, it goes for every town, anywhere. It's where YOU live, and you're home. So you need to ask yourself, do I like living this way? And why don't/do you?